I have a serious passion for cooking and baking. I always say that I would have been a chef in another life. I think it comes from the fact that my mom is an outstanding cook. I know everyone says their mom is the best cook, but trust me: we have serial eaters in our family and the love of food runs in our veins, but no restaurant meal, no other family member’s cooking compares to my mother’s. Nothing even comes close, and I’m not exaggerating! Whenever I feel like unwinding, I put on my apron and I cook up a storm or I bake a few loaves of bread. Speaking of which, there’s something so magical about the aromas that fill the house when you make homemade, freshly baked bread, or any other thing baked for that matter. When it comes to baking cakes, I finally mastered a few recipes after endless trials and errors, but I never thought of making an eggless cake until last week when I wanted to bake a cake and I didn’t have any eggs in my fridge (to my surprise because we consume a lot of eggs in my household!). I don’t know if I would have ever considered the idea had there been eggs in my fridge. Just like every new recipe I try, I google a little, watch a couple YouTube videos and then go ahead and come up with my own recipe. When you bake often, you get better at baking math so you can put 2 and 2 together and have a foolproof recipe! 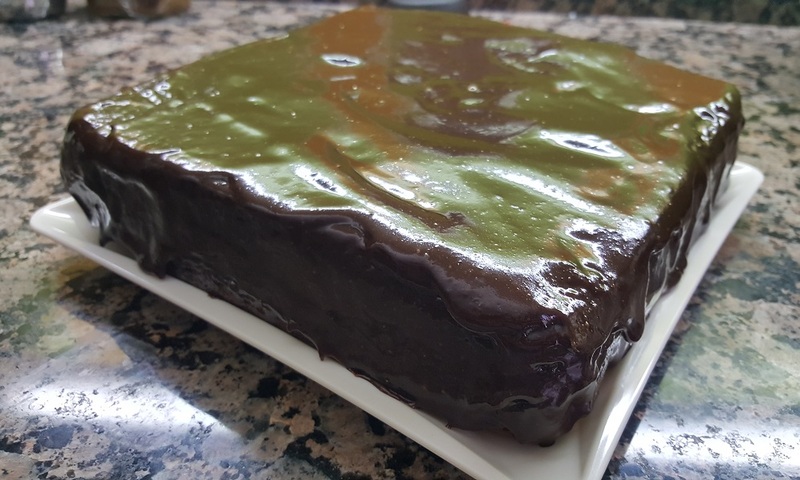 So, without further ado, below is my recipe for a fluffy and flavor-packed eggless chocolate cake with chocolate ganache glaze. Whisk together condensed milk, oil, milk, coffee and vanilla extract. In a separate bowl, whisk together all the dry ingredients. You can sift the cocoa powder for a fluffier cake. 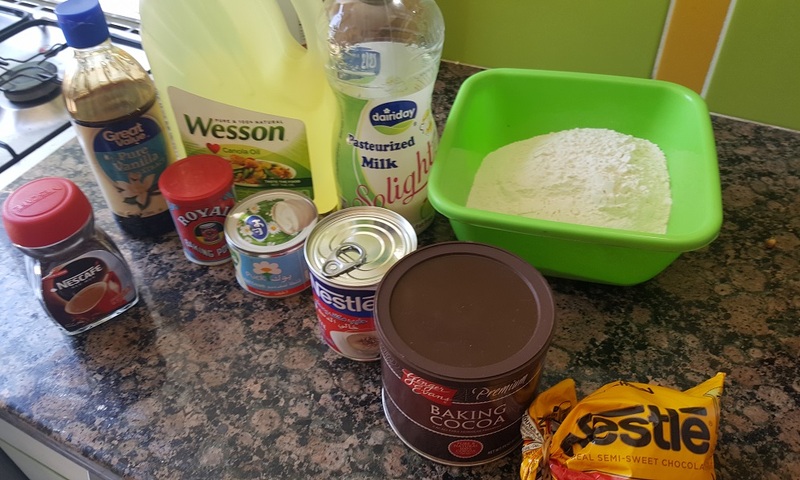 Gradually add the dry ingredients to the wet ones, whisking until all ingredients are incorporated and the batter is not lumpy, and adding a bit more milk if necessary. Pour batter in a greased and floured tin and bake in preheated oven (180 degrees C or 375 F) for about 40 minutes or until toothpick inserted comes out clean. Allow the cake to cool in the tin for 5 minutes before transferring it to a wire rack to cool completely. While the cake cools, bring the cream to a boil and turn off the heat. Stir in the chocolate chips until fully melted and incorporated with the cream. Now you have a tasty ganache that you can pour over the cake! 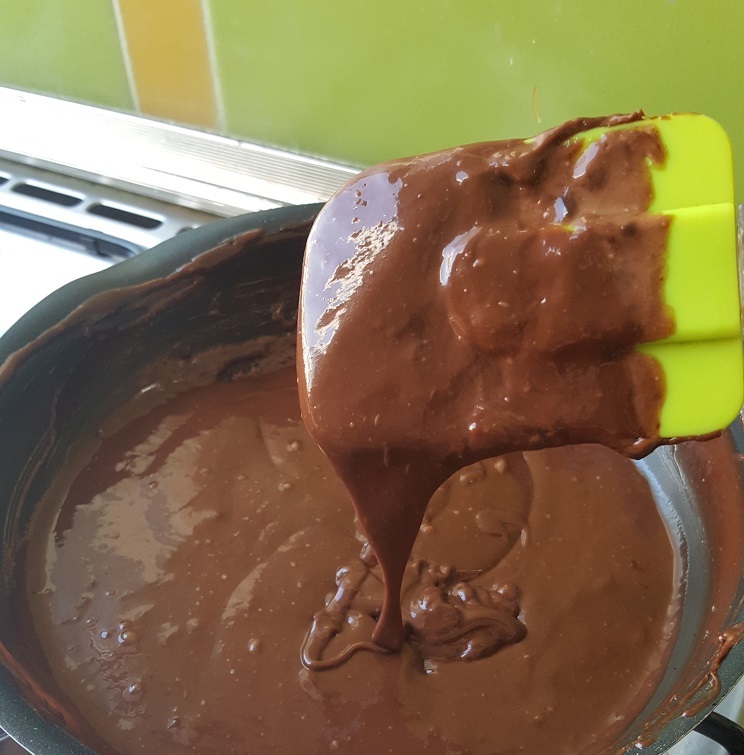 Allow the ganache to set for about an hour. Slice the cake and serve with some fresh strawberries and sprinkled with chocolate chips.